I love stuff in miniature. Specifically food. A good canape is a truly joyous thing, and I have an abnormal number of cookery books dedicated to this subject. 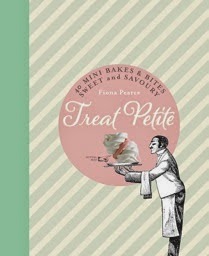 I was thrilled to receive a copy of Treat Petite recently, and have finally gotten around to trying a number of the recipes. It's a lovely little book with some original ideas for both savoury and sweet tiny treats. My versions of these were not miniature, as I didn't have the inclination to purchase a miniature madeleine mould, however the results were just as good. They had a lovely balanced flavour, the zest gives an orange zing, and surprisingly the Earl Grey wasn't too dominating. All the flavours meld together to make a perfectly delicious bite. The recipe made a batch of 12 as opposed to the 48 indicated, and the cooking time increased to 15 minutes in the oven. Of the handful of recipes I tried this one wasn't at all successful, and I have a suspicion that the ingredients/recipe isn't quite right. I used mini muffin cases due to the fact that the first batch of lemon sponges I made were welded to the containers I baked them in - which at first I thought was due my under-buttering the dishes, but in hindsight I think it was due to the batter mix not being quite right. The recipe had far too much raising agent in the mix, which resulted in producing a holey (as opposed to airy and light) cake, with a baking powder aftertaste (not nice!). In addition, the glaze also seemed wrong - I halved the sugar added to the fruit juice, and it was still too sweet in my opinion. I love the idea and flavour combinations of these cupcakes however, so will probably play around with the recipe a bit to try and get the amounts right. A lovely little bite-sized sweetly spiced pastry treat - these were lovely and disappeared way too quickly. There's no photo, as I'll admit my palmier rolling skills aren't up to much and they didn't look amazingly appetising! A really simple recipe made by sprinkling a mixture of caster sugar, cinnamon, ground ginger, cloves and cardamom onto puff pastry, rolling, and baking. Very tasty. This recipe is a fabulous idea using the all the ingredients from one of my favourite cocktails. The cupcake is made with coffee and Kahlua, filled with a white chocolate and vodka ganache, and topped with Kahlua meringue buttercream. I adapted the recipe slightly, excluding the buttercream, and topping with the ganache instead. The cupcakes themselves are moist and slightly sticky, with a lovely background flavour of Kahlua and coffee - a very adult cupcake. This was such a nice recipe and I'll definitely make the cupcakes again, possibly as a larger cake next time and then drizzle with a Kahlua syrup rather than the ganache (which was lovely, I'm just not a massive fan of white chocolate). A lovely idea and very simple but delicious, essentially teeny tiny vol-au-vents. The onions are cooked low and slow with butter, sugar and red wine, to produce something oniony, sticky and sweet. A tiny bit of goats cheese and thyme leaves on top make a delicious bite. In summary I think this is a lovely little book, perfect as a stocking filler for the baker in your life. With several hits and only one miss, this will definitely be getting lots of use.